Working on Thousand Oaks screen doors as a mobile screen repair is our specialty. No screen door or window screen repair or replacement job is too big or too small. If you need rescreening, pet screen or pet proof mesh, frames fixed we can do it all on the spot. We bring our mobile screen repair shop to you. Patio sliding screen doors to window screens with bent or cracked plastic corners, we do it all. Thousand Oaks screen doors are repaired every day and we are pros at it. we can take care of all your needs, we are prompt and never late, have been specializing in fixing and replacing the most used door in the home (backyard screen door) for almost “20” years (1993) and do the job right the first time, leaving you with a slider that will not give you anymore problems. Some examples of what you should look for if you are having screen door problems with your Thousand Oaks screen doors. First I look at the frame and make sure it is straight, old frames are pretty bang up but getting them straightened to be in a bit better shape makes a world of difference and might be able to be I rescreened. A nice tight mesh and right sized ribber spline, they will look a lot better and keep the insects out. If the sliding is the problem with your screen door then rollers should be evaluated, maybe they should be lubricated and repaired or just replace them. The wheels on every frame are the main sliding part and need to work right. After that is all checked make sure to dust off the tracks and lube them for a better slide. 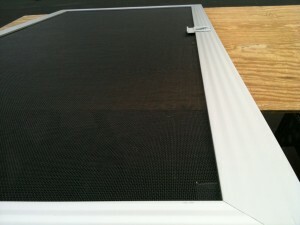 if your are fighting your slider we specialize in Thousand Oaks screen doors and window screen repair and replacement. Smaller jobs are ok and we always offer free written estimates. This entry was posted in Thousand Oaks Screen Doors and tagged thousand oaks screen doors by Marcelo. Bookmark the permalink.